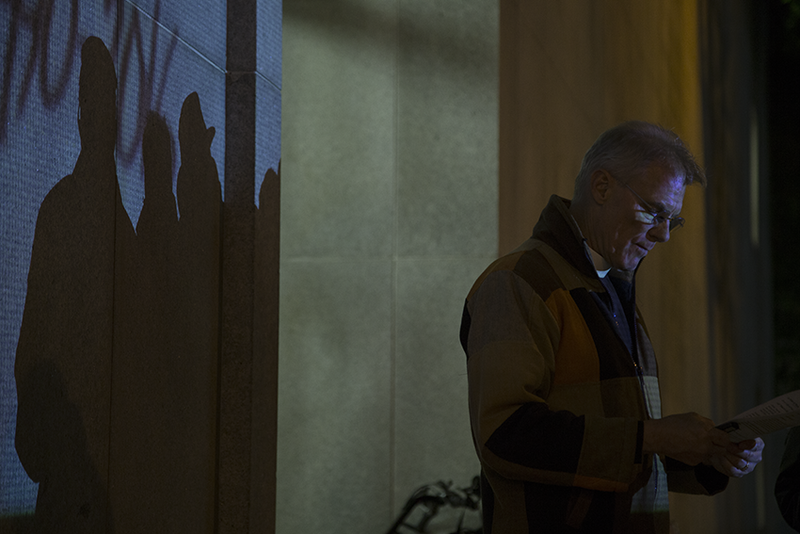 Volunteers from the San Francisco Projection Department beamed images in support of the family of Luis Gongora Pat on the Hall of Justice during their 24 hour vigil. Photo by Abraham Rodriguez. With a medley of instruments, the family and friends of Luis Gongora Pat celebrated what would have been his 48th birthday in front the Hall of Justice in a vigil with candles and cake. 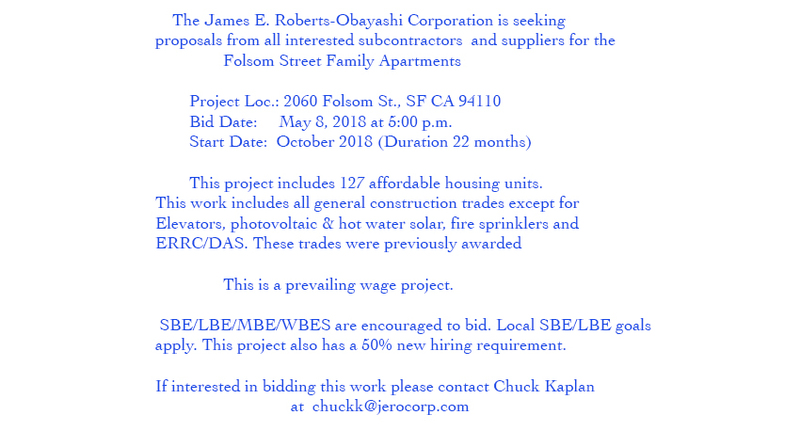 But two years after police shot and killed Gongora Pat, his family and friends aren’t any closer to getting any answers from the SFPD or investigators. “What we’re trying to highlight with this vigil is that we want an end to police impunity,” Adriana Camarena said. Camarena, the family’s representative, said that a hearing between city attorneys and the family’s attorney, civil rights lawyer John Burris, was set for this Friday. She also said that a federal civil suit trial originally set for Oct. 22, 2017, was pushed back to February because of a change in judge. 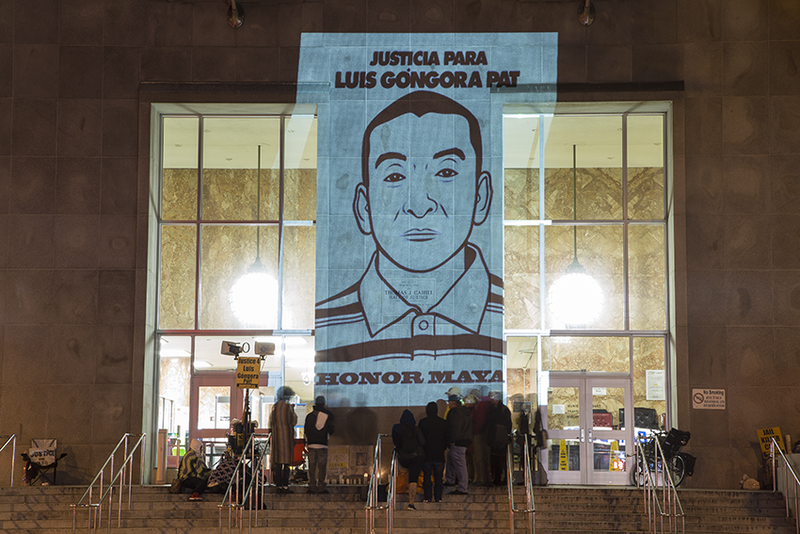 At the Hall of Justice Wednesday, volunteers with the group called “Justice 4 Luis Gongora Pat” held a 24-hour vigil to protest inaction from the district attorney’s office. Every hour, they recited the names of 24 people killed in officer-involved shootings around the city, including six in the Mission. In each of those incidents, the organizers say, district attorney George Gascon chose not to file charges against the police officers involved. “Since D.A. Gascon entered office, there have been 24 police shootings, and he has never pressed charges against any officer involved an officer-involved shooting,” Camarena said. Deacon Davidson Bidwell-Waite from Grace Cathedral holds prayer with a small crowd in front of the Hall of Justice. Photo by Abraham Rodriguez. According to Camarena, Gascon met with Gongora Pat’s family in February, and made assurances that his office would take “six to eight weeks” to decide whether they would file charges against the two officers in the shooting incident that that occurred on April 7, 2016, on Shotwell street. Witnesses and police officers gave contradictory accounts. Two witnesses reportedly saw the victim without a knife before he was killed. Police and city attorneys say Gongora Pat brandished a large knife and lunged at them. The family says that Gascon and his office have been silent. “Just looking at it, there doesn’t seem to be anything going on,” Jose Gongora Pat, the deceased man’s brother, said. Carlos Pol Pat, Luis’ cousin, said he was frustrated that Gascon couldn’t meet with the family or even update them on the case. Among the protesters were the family of Jesus Adolfo Delgado, who died March 6 in an officer-involved shooting, and the family of Alejandro Nieto. Makeshift memorials and candles were laid out in memoriam of Gongora Pat and Delgado. At night, the vigil attendees threw on ponchos and warm clothing as they prayed and held services in front of the memorials. A projector showed images of the deceased man’s family. Calls placed to the district attorney’s office and the offices of John Burris were not returned. Camarena said they plan to hold a vigil until 6 p.m. Thursday. Jose, I’m sorry for your loss. Your brother was a homeless ILLEGAL ALIEN, so messed up that none of his family members, you included, apparently wanted to take him in. There’s no shame in having a family member who is a drug addict, nor is there shame in not providing a roof over their heads because their lifestyle impacts yours negatively. However, there is shame in trying to shake down the city of Saint Francis, the city that has offered sanctuary to you and your family. And other witnesses saw him with a knife and called 911. Why is there no mention of the fact that there was at least one call to 911 reporting that this stellar human being, known as Gongora Pat, was staggering around that homeless encampment wielding a large knife? The 911 call is the reason the cops showed up there to begin with, yet you don’t acknowledge that fact. Denial of key facts is not going to help you win a case, should you choose to pursue one. That is just precious! Would you dare to hold a vigil in Mexico demanding “an end to police impunity”? Not bloody likely! “Gongora Pat celebrated what would of been his 48th birthday”………..I believe you meant to say “what would have been”.